The Ports of Los Angeles and Long Beach (below) form one of the largest combined port facilities in the world and play major roles in the California and US economies. The ports have faced several tsunami attacks this century. In most cases, the waves travelled for many hours across the Pacific Ocean, leaving sufficient time to prepare for their arrival. Tsunamis generated by underwater landslides and slumps are a local hazard that could strike the ports within minutes of catastrophic failure of a large sediment mass. Ships and harbor facilities could suffer significant damage from either large motions or strong currents associated with tsunami waves. US Geological Survey bathymetry data along the Southern California margin revealed a giant mass movement in San Pedro Basin that was likely tsunamigenic, but failed before written records of the region became available. A similar submarine mass movement could be triggered by a relatively mild earthquake along an active fault running through Palos Verdes Peninsula. Such temblors are expected about once every century. The project will predict potential tsunami amplitudes and their respective impacts on port facilities. On July 17, 1998, shortly after 7 PM local time, a large tsunami more than ten meters above sea level swept over a sand spit in front of Sissano Lagoon, along the northern coast of Papua New Guinea (below). The tsunami struck twenty minutes after a nearby magnitude 7 earthquake and swept more than 10000 villagers into the lagoon. At least 2200 people died in the catastrophe. Results from two oceanographic surveys organized by JAMSTEC and SOPAC indicate that the tsunami was generated by a giant underwater slump consisting of around 4 cubic kilometers of cohesive sediment. Bathymetry data from the first cruise is available over the internet. A tsunami similar to the PNG event could occur shortly after a nearby earthquake along much of the Pacific Rim, including Southern California. 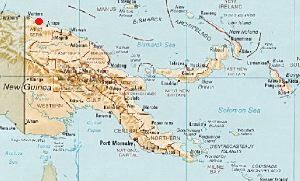 As such, the events in Papua New Guinea offer lessons and opportunities for both populations and policymakers throughout the entire Pacific Basin. 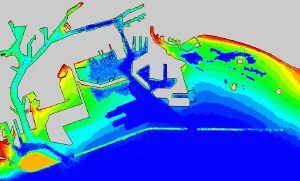 The project will enhance tsunami hazard assessment and warning efforts by developing novel tsunami simulation techniques and proposing new tsunami detection methods. Human fascination with flight is usually linked to observing the flight of birds, while bird plummage confers status in many cultures. These same feathers make studying the aerodynamics of bird flight rather difficult. The flapping flight of bats is similar to birds and significantly easier to study because large flaps of elastic skin span relatively sparse wing bones. Bats form one quarter of all mammalian species and are most closely related to primates, such as humans. Bat wings are like our arms but with highly elongated fingers. About half of all bat species have evolved a sophisticated sonar system to detect prey that also makes them rather homely animals with creased faces and oversized ears. Most mammals are nocturnal and bats are no exception. This combination of facts tends to make bats more frightening and less popular than their feathered counterparts with simple beaks and slick feathers. Misconceptions about bats combined with human encroachment now means that bat conservation has acquired significant ecological importance. 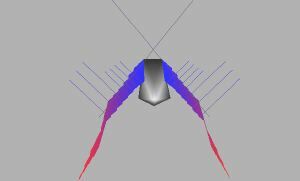 The project uses a detailed computer model of bat flight (below) to reproduce the biomechanics of flight and to explain the evolution of mammalian flight in these close relatives.